Written in 1935, La Nativité du Seigneur is one of Messiaen’s most popular organ works, and a piece that helped to establish the then 27 year-old as an important figure in contemporary music: nine extraordinary meditations by one of the twentieth century’s musical titans, performed on the magnificent King’s College Chapel organ by former organ scholar Richard Gowers. In September 1931 at the age of 22 Olivier Messiaen took up the prestigious position of Organiste Titulaire at the church of La Sainte-Trinité, promising ‘to perform his duties with wisdom and classical restraint’. He went on to do so with dedication and distinction for some sixty years—but if he managed to show ‘classical restraint’, this was only by keeping his own compositions out of the picture. Even in these early years, despite his pale demeanour and quiet, shy manner, his music already betrayed a direct, passionate intensity and bold originality. In the years following his appointment at the Trinité he wrote a stream of striking orchestral and organ works on religious themes. At this time there was much debate among Catholic thinkers concerning the relation of faith to the modern world. The writings of Thomas Aquinas had held canonical status since a Papal encyclical of 1879, following which a whole culture of ‘neo-Thomist’ ideas came to dominate French religious thought, including the writings of Jacques Maritain (1882-1973). His treatise Art et scolastique of 1920 set out a theological rationale for artistic practice as a pure, objective creative act untainted by personal expression or emotion; this rather austere manifesto struck a chord and came to underwrite (perhaps surprisingly) the most chic and coolly provocative new music being written in Paris in the 1920s—that of the neo-classical Stravinsky and Les Six. Although Aquinas himself remained vitally important to Messiaen throughout his life, he hated neo-classicism, calling it ‘dry’ and ‘mechanical’, and could not accept that a religious subject could sincerely be treated in such a dispassionate, impersonal manner. Already in his earliest pieces, religious contemplation for Messiaen is voluptuous, sensual and violently expressive. One notable aspect of the sensuality in Messiaen’s music was his distinctive array of modes, whose symmetries and cyclic properties lend a floating, suspended quality to both harmony and melody that can become hypnotic, especially at a slow tempo. He discovered these modes early on, and in the orchestral L’Ascension (1932-33) they are sculpted into the first of Messiaen’s grand religious designs: four movements which lead the listener on a broad arc from expectancy to exultation. The arrangement of this work for organ (1934, including a new and exhilarating third movement) created the first of Messiaen’s organ cycles, and surely paved the way for his next imposing religious fresco, La Nativité du Seigneur, written in the mountains near Grenoble over the summer of 1935. ‘I think I have made progress from the rhythmic point of view’, he wrote to his friend Claude Arrieu in September of that year, and indeed it was in this new work that Messiaen unveiled a novel and striking approach to rhythm, conceived very much as a counterpart to his symmetrical modes, combining both symmetry and irregularity and sweeping away the traditional, regular metres which had quietly underpinned most European music for the last several centuries. What catalysed this startling move was finding, in the article on ‘India’ from Lavignac’s recently completed Encyclopédie de la Musique, a list taken from a 13th-century Sanskrit treatise of 120 rhythms from different regional musical traditions. For Messiaen, these 120 deçi-tâlas offered a way to handle rhythm that was at once vigorous, sophisticated, and susceptible to infinite elaboration. He did not see these ‘Hindu rhythms’ as culturally marked, but universal: he felt no need to investigate how they might have been used in Indian music nor did he use them to suggest any kind of ‘orientalist’ allure. This new rhythmic armoury, combined with his distinctive modal harmony, now gave Messiaen a complete and highly original musical language, and the means to develop a far wider range of moods and ideas than in any piece of his up to that point. It is easy to understand why he viewed La Nativité as a landmark in his development. The emotion, the sincerity of the musical work: to be at the service of the dogmas of Catholic theology. […] Theological subject matter? The best, since it contains all subjects. And this abundance of technical means allows the heart to overflow freely. Responding to the exhortations of Dom Columba Marmion in his book Le Christ dans ses mystères, which Messiaen acquired in 1931 and took deeply to heart, La Nativité contemplates the meaning of each element of the Christmas story with a view to making it live afresh inside each listener. The arrangement of nine topics shows a characteristic intertwining of symbolism, divine (mostly prime) numbers and religious storytelling. A lengthy preface written by the composer for the published score indicates five main theological ideas: predestination (III); God living and suffering among us (IX and VII); three births—of the Word (eternal), of Christ (temporal), of Christians (spiritual) (IV, I and V); characters which lend the festival of Christmas a particular poetry (the angels, the Magi, the shepherds); and the motherhood of the Blessed Virgin, symbolised by the work’s nine movements. Rather than simply tracing the narrative event by event, therefore, the cycle moves between character portraits (which evoke the main episodes of the story by association) and contemplation of their broader significance, perhaps distantly recalling the layers of narrative and devotional meditation in Bach’s Passions. I was boarding a train from Nanjing to Tianjin on the King’s Choir tour to China in 2016 when Stephen Cleobury, to my surprise and delight, asked me whether I had some music in mind for a solo recital CD on the College’s own label. My very first thought was La Nativité, which came to mind for several reasons. As it happened, I was preparing it for a recital in the coming months. It also occurred to me that it is a good length for a CD. More important than these conveniences, however, was my strong feeling that this is a piece of music that has been connected with the Chapel and organ at King’s for a long time; it seemed a shame that this connection had never been reflected in a recording of it. In recent decades, the finale Dieu parmi nous has often followed Bach’s In dulci jubilo at the end of A Festival of Nine Lessons and Carols, broadcast live on Christmas Eve. The organ scholar is allowed to choose the second voluntary, and this particular piece of music fits the brief very well. More often than not, the Organ Scholar chooses something fast and French. Every three years or so the opening line of Dieu parmi nous signals the moment when the radio presenter takes over again. It is the last musical glimpse of the Chapel’s annual broadcast. The connection between Messiaen and King’s goes deeper than the frequent appearance of Dieu parmi nous in this broadcast. Simon Preston, a former King’s chorister who went on to become Organ Scholar in 1958, was one of the first organists to champion Messiaen’s music in England. In 1962 he was asked, at a week’s notice, to record L’Ascension at King’s for the record label Argo. In 1965 his Messiaen collection expanded to include La Nativité from Westminster Abbey, where he had become Sub-Organist. 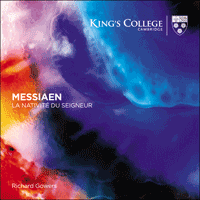 As a result, the first recordings of Messiaen by a British organist involved both La Nativité and King’s, but narrowly missed combining the two. Recordings of Le Banquet céleste and Les Corps glorieux from St Albans Cathedral followed. A remarkable aspect of Preston’s recordings in the 1960s is that these four works had existed for nearly 30 years, dating from 1928 (Le Banquet céleste) to 1939 (Les Corps glorieux). Messiaen’s progressive style wasn’t universally popular over the Channel, particularly in ecclesiastical Paris. There, the musical language of the leading organists of the day—Charles-Marie Widor (1844-1937) at St Sulpice and Louis Vierne (1870-1937) at Notre Dame—lagged behind Stravinsky, Ravel, Satie and the rest of the local avant-garde. Preston’s efforts also included his own composition Alleluyas, an organ work built on Messiaenic modes and rhythms. The piece now has a prominent place in the UK organ recital repertory. It is not clear when Dieu parmi nous was first played at A Festival of Nine Lessons and Carols, but the first mention of it in a service paper is on Christmas Eve 1965. It’s not a stretch to imagine that, since the service has been both broadcast and emulated so widely, it may have contributed to making this final movement as well-known as it is. As for performances of the whole work, we can't be sure when these first happened at King’s either; suffice it to say that performances today by the organists at King’s are regularly some of the best-attended recitals in the Chapel. It is appropriate that one of the organs included in Preston’s set of records, that of St Albans Cathedral, was a pioneering instrument of a new trend of English organ building in the 1960s. Ralph Downes, who had supervised the design of a new Walker organ for Brompton Oratory in Knightsbridge in 1954, designed a neo-classical specification for the instrument. It included a Cromorne and a large range of mutation stops but forwent Victorian essentials such as an Oboe or a Tuba, which had featured on the previous organ. A decade later he used the same principles on a far greater scale, designing the new Harrison & Harrison organ for the Royal Festival Hall, which—to the lament of many choristers—is probably the largest in the country without a Tuba. King’s had its own rebuilds. The 1968 overhaul of the Harrison & Harrison organ included a new 3-rank Sesquialtera on the Great division and a harsh-sounding Schalmei on the Pedals. However, a major and progressive 1934 rebuild had already seen the addition of separate mutations to the Choir division, meaning that many of the neo-classical features that might have been added three decades later were already there. That said, the re-voicing of the organ in 1968 also resulted in a mellower tone overall, and the most unforgiving stop—the Choir Dulzian—was replaced in the 1990s with a softly spoken Corno di Bassetto. As a result, the organ at King’s became highly versatile, but retained its romantic character. Critically, these changes reflect movements already taking place on the continent. Messiaen, who took up his position at La Trinité in 1931, requested changes to the organ as soon as 1935. To the Positif division he added two mutation stops common to the French Baroque era: a Nazard and a Tierce. Another Nazard joined the Swell division alongside a 3-rank Cymbale, another mutation, and a 16’ Bourdon. One of Messiaen’s unusual traits was writing exact registrations into editions of his organ music, rather than the groups seen in Widor or Vierne that include ‘Fonds’ (foundation stops) or ‘Anches’ (reeds). The 16’ Bourdon, a low flute normally found only on the Pedals, is particularly common in his music and its absence on some other instruments can be one of the greatest problems when playing Messiaen elsewhere. For many listeners, the sound of French organ music is closely connected with the sound of French organs, especially those of Aristide Cavaillé-Coll (1811-1899), whose ‘orchestral’ colours inspired generations of organists to compose prolifically for the instrument. But attempting authenticity for recordings today is almost futile, even in France. During the twentieth century, so many of the great organs of Paris and the provincial cathedrals underwent tonal alterations with neoclassical influences that very few remain in their original state. An exception is St Sulpice in Paris, which remained virtually unchanged because Widor and his successor Marcel Dupré, whose combined tenures lasted a century, both had conservative tastes and did not allow it. In King’s College Chapel the organ is essentially an English romantic instrument, albeit equipped with all the necessary resources to obey Messiaen’s registrations, and it is voiced to accompany choirs rather than to overwhelm the building with sound. That said, the major restoration of 2016 improved the distribution of wind around the organ so much that the loudest stops, some of which had been caked in dust, have become noticeably louder. The combination of some of these improved colours and the famous acoustic creates a sound that may not be French but is certainly a valid alternative. It is perfectly possible to bring Messiaen’s music to life and keep reasonably faithful to his registrations, but the stops themselves will always sound distinctly English. Even without a direct link to Messiaen, the organ and organists of King’s have done much to promote his music in the UK, and with this recording I hope I can make this my contribution.